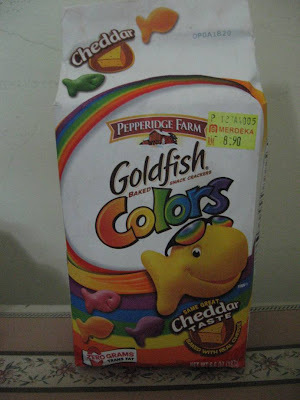 My girls grabbed a packet of this Goldfish colors cheddar cheese biscuit from the biscuit section in the supermarket on Easter Sunday. They want this as their biscuit treats, at a glance on the price I was about to say NO. It is pretty expensive to me but It's Easter, we should be celebrating, and I like the packaging, it should taste good too, so I said YES, we can have it. The packaging is very colourful and nice, any kids will be attracted to it just by looking at the packaging, the taste is secondary. I attracted to it too. We are very eager to open up the pack to have a taste of this cheddar cheesy biscuit. The biscuits look like this. 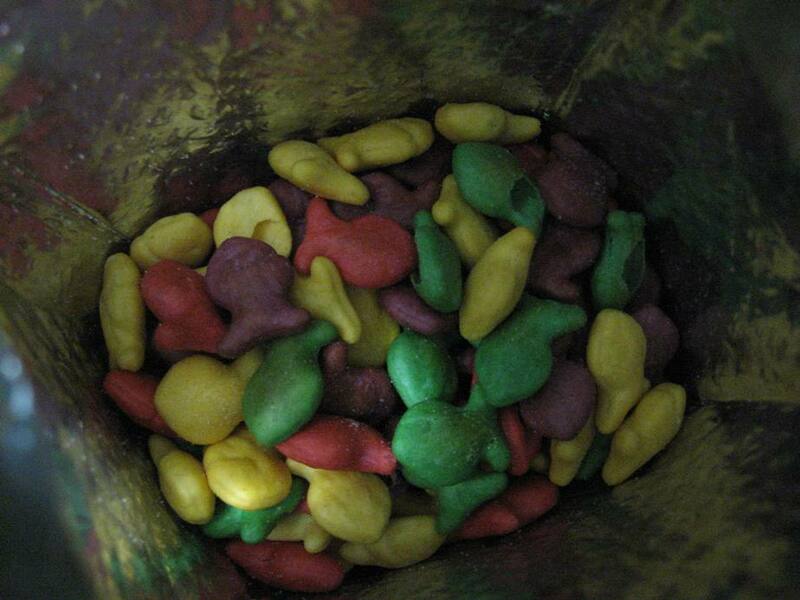 Colourful fish shape just like what have mentioned on the packaging. After a few bites, 3 of us stop eating. The taste is not to our preference, no taste of cheese and the biscuit is neither sweet nor savoury. What am I going to do with this packet of biscuits, definitely we wouldn't be able to finish it up and don't want to throw away just like that. I am sure someone would love it. I suggest my girls to bring to their school and share with their friends. Crystal welcome the idea but Pearl said no thanks. Crystal brought a small container of the biscuit to school. It seems that they did not like the biscuits too because she brought back the remaining. Ended up we still have got 80% of the biscuits. Me, being the "rubbish bin" of the house will have to finish it over time because I do not like the idea of wasting food. Dipping the GoldFish Colorful biscuits in the coffee would be a good idea I suppose!! Just like eating cereals in a bowl of milk. Hope my idea works! The moral of the story is don't be deceived by the packaging of the product. Don't judge a book by its cover. Hehehe! I won't buy this biscuit, if I see it in the store next time. Thanks for sharing.